Can Baldness Impact Your Career? Hair loss, also known as alopecia, usually affect the whole generation and day by day it increasing. It is seen that over fifty percent of men and women experience hair loss during they reach at the age of 50. A man get confidence when they have full hair and a less hair decrease the confidence. At a young age losing hair generally bring down the confidence of a man and it started affecting the career as well. Every man focuses on their personality and love to look great and when he does not get the look as he wants the look then this negativity shows in his performance at work and other places. A man goes bald due to his age and also depending on the genetics. As baldness is inevitable. Now we should talk about how baldness affects the professional life. When any person starts to develop his professional career, only the confidence level is important. Lack in self-confidence hurt many people behavior and this causes many problems in their life. According to the American Academy of Dermatology – Hair loss has adverse psychosocial consequences that affect the life of any person. It demoralizes the self-esteem and makes the person be depressed. 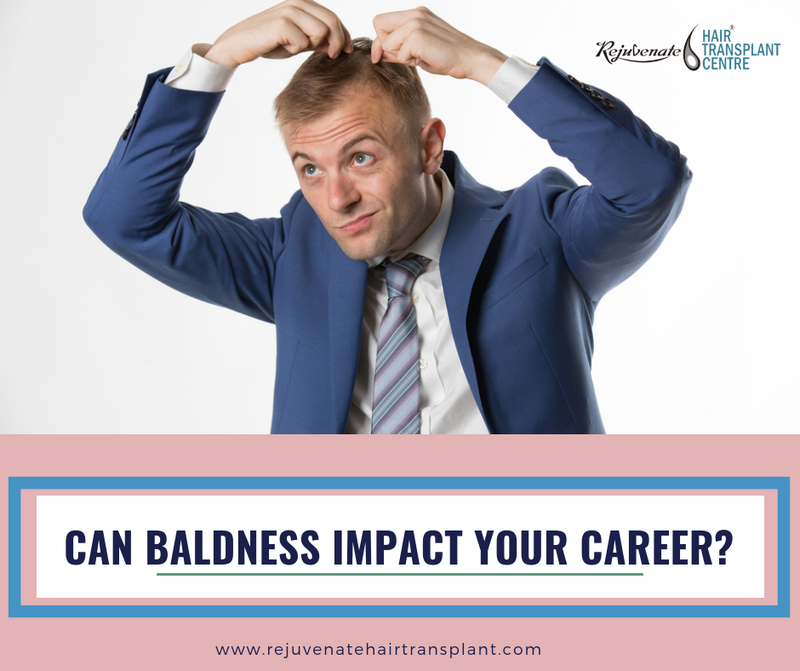 Many studies show that people who are suffering from baldness impact of their personal life as well as professional life. The first impression plays a big role when you meet someone and it shows your appearance and everyone’s first judged only by appearance. Many people laugh to see their baldness and in some business area, a man’s hair loss will become a stop gate of their careers. This issue is also seen by many people in their interviews and they try to deal with them. A professional look matter everywhere and it can make a deal or can break it. A baldness face shows some negative impression and it could be a factor. Some studies indicate that someone’s appearance actually determines by their looks and style. It is shown that 25 percent of men get baldness as they reach by 30 and the number is increasing and reach up to 66 percent when a men goes bald when they reach at the age of 60. There can be over 80 million people experiencing baldness due to their genes. In can be an issue for their growth in their jobs. When anyone is progressing the baldness affects the person’s confidence. This lack of confidence reduces the decrease the change in corporate growth. It can be built with the help of hair transplant only. Every men and woman love to style their hair and it is very important in special events or party. The aim to impress someone a hairstyle matters as it shows the personality of the person. Many people style their during their interview or to impress boss on a regular job. Due to inability to style the hair, it will be the depressed situation. As they lose the ability to style the hair and in their day to day activities. With effective hair loss solutions, anyone can stop the hair loss and can able to style the hair the way they like. Hair restoration is always a good option for baldness people who want their head fuller. As this provides confidence back and reason to aim growth. If you plan for a hair transplant then you will definitely get a full natural hair as it grows naturally. However, if improve the personality and increase the chances of a job as well as career advancement. Nowadays a high competition arises in the market and it is a hard truth that physical appearances can provide you success. The way you look matter in everyone’s eye. It also increases confidence and brings out professional success. Due to competition in the market, every employers and client think that younger is better. Thus, looking and feeling younger increase the chances of new career opportunities and increases the chances of landing a job or promotion at work. As hair transplant surgery provide good results and improve your appearance. As looking better change your attitude and bring the positivity in life which brings a new edge to their career.